B.E. (1980) in Electronics and Communication Engineering from University of Madras. M.E. (1982) in Electronics Engineering from Anna University, Madras (now Chennai). Ph.D.(2002) in Electrical Engineering from IIT Madras, Chennai. "A new realization method for multidimensional GIC digital filters", IEEE Transactions on Circuits and Systems - Part 1, Vol.49,no.1,2002, pp 66-69. "Design of Two-Dimensional Pseudorotated Digital Filters using the concept of Generalized Immittance Converter", Circuits, Systems and Signal Processing, Vol. 22, No. 4, 2003, pp 367-375. "Realization of modular multidimensional complex digital filters using GIC concept", IEEE Transactions on Circuits and Systems - Part 2, Vol. 51, No.8, 2004, pp 430-435. "New modular Multidimensional Digital Filter structures based on GIC concept", Circuits, Systems and Signal Processing, Vol. 24, No. 3, 2005, pp 229-241. "New modular complex wave digital filters for signal processing applications", Proceedings of the IEEE Region 10 International Conference on Electrical Technology( TENCON 2001), Singapore, August 2001, pp 219-225. "Personality card Eliminator for Digital IC Tester " Journal of The Institution of Engineers(India), Vol.66, part ET1, August 1985, PP 15-17. 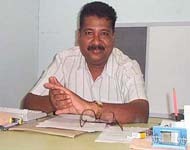 "A simple and Novel Fuzzy Logic based Algorithm for Radial Basis Function Neural Networks", NCNNFS '97, Anna University, Chennai, July 23-25,1997. Faculty at the Thiagarajar College of Engineering,Madurai during July,1983 to April,1987. Faculty at the National Institute of Technology,Tiruchirappalli since April,1987. Has been selected for inclusion in the 22nd (2005) edition of Marquis 'Who's who in the world'. Was adjudged the All India Best Trainee N.C.C. Officer by the Air Force Administrative College in 1988 and was awarded a Gold medallion and a Trophy.